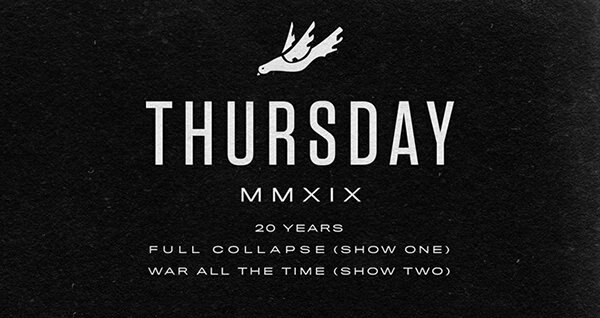 Thursday will celebrate their 20th anniversary as a band by touring the U.S. in early 2019. One leg of the tour will feature Vein, while the other will feature American Pleasure Club. Once the tour is over, the group will disband indefinitely. Dates can be found below. "It's our honor to announce that we'll be ending our 20th Anniversary by taking Full Collapse and War All the Time on the road, for a very limited US tour, in early 2019. When we reunited the band, two years ago, we had no idea that it would carry us through our 20th year or that we'd be selling out every show that we play in 2018. It's been a very gratifying and humbling year for us. This tour is our attempt at saying 'thank you' to all of the people around the US that have supported us for all these years. We'll be playing small venues, like we did when we began touring. At the conclusion of this tour, we intend to put an end to 'the reunion.' When we stopped playing last time, it wasn't on the best of terms. This time, we get to put down touring on the very highest of notes: in each other's lives and able to pick up and play together behind closed doors whenever we want. If we are ever able to do Thursday again, it will be a new, separate chapter. Thank you all for your time, attention and friendship.